Every day that the Washington University chancellor fails to answer questions and demands for the university to cut ties with the energy giant, he and his university remain on the wrong side of history. This post originally appeared in EcoWatch and is reprinted with permission by the author. 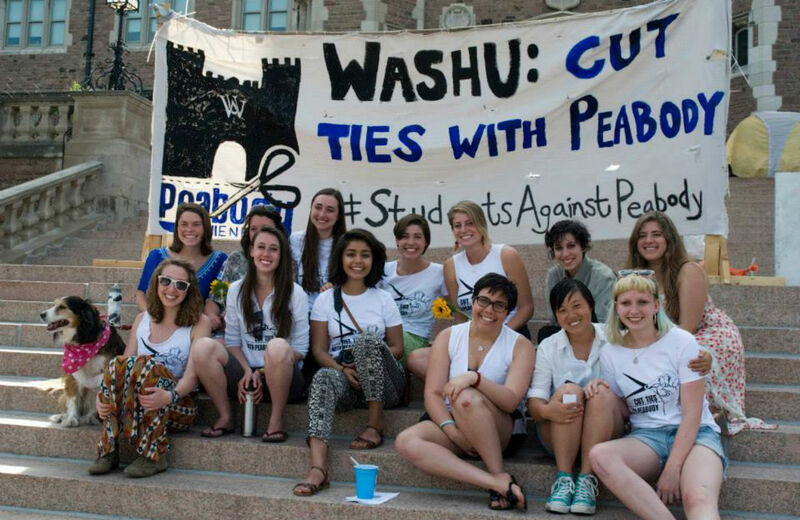 In an emerging public relations nightmare for Washington University officials, the sit-in against Peabody Energy ties entered a historic third week, as students continued to press demands after a faltering statement released yesterday by Chancellor Mark Wrighton. Let’s face it: With growing national media attention, growing outrage over Peabody violations, and growing plans for nationwide rallies against Peabody on its shareholders meeting on May 8, the moment of truth for the chancellor and the board of trustees about Peabody’s toxic relationship with Washington University has arrived. And this Peabody moment of truth has been years—even decades—in the making. The Wash U student protests have been raising the ante for years—I’ve watched with amazement, over the last decade, as I’ve been chronicling Peabody violations around the world—including the Black Mesa tragedy, which I consider one of the worst human rights and environmental disasters in American history. This much we all know: The Wash U students are on the right side of history, and at a certain point, Chancellor Wrighton and the board of trustees will end their denial and join the students’ clear-headed demands. And it won’t be the first time. Consider another date in May in Washington University history: May 9, 1952, when the board of trustees found it “increasingly difficult to ignore mounting public sentiment and maintain its segregationist policy,” and finally bent to the will of a long-time student movement to officially integrate. It’s time once again for Washington University to be on the right side of history. Putting aside climate change denial and environmental destruction, how can Chancellor Wrighton and Washington University condone the following actions by Peabody as ethical behavior, honesty, integrity and good judgment? 2014: Does Peabody remain in violation of federal laws for improper handling and holding of Native American burial remains and artifacts from Black Mesa? 2014: Peabody illegally clear-cut endangered habitats in Shawnee forests in Rocky Branch, Illinois. 2013: Judge rules that Peabody violated EPA rules at their Indiana strip mine. 2012: Peabody closed a southern Illinois mine due to safety problems and violations. 2011: Peabody receives MSHA notice of pattern of serious violations for an Illinois mine. 2000–09: Peabody wracks up more than 8,700 “significant” mine safety violations. 1986: Peabody pleads guilty in miner’s death in Illinois. Every day that the Wash U Chancellor fails to answer the sit-in students’ questions and demands, he and his university remain on the wrong side of history. And the nation—that is watching—knows it. Jeff BiggersJeff Biggers is the author of Reckoning at Eagle Creek: The Secret Legacy of Coal in the Heartland, forthcoming from Nation Books.